If you're ever participating in a trivia game where you're asked what professional team did Scott Gomez last play for, your answer as of right now would be the ECHL's Alaska Aces. 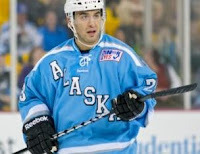 While it was thought that Gomez would be a buyout candidate this season, it appears that the Montreal Canadiens will wait until the summer to buyout the 33 year-old Alaska native. In the meantime, the Canadiens have informed Gomez to return home as he will not be playing hockey for them this season. With that news, Scott Gomez's NHL career may come to an end since he'll be spending the next four months watching rather than playing. It's not far-fetched to say that Gomez won't be able to find a team that will sign him to a much lower salary than what he has received in La Belle Province. Perhaps he'll return to New Jersey where he can help a young winger find the net more often. Maybe he'll be welcomed back in the Big Apple as a Ranger where he can play a more defensive role on a star-studded lineup. Perhaps he'll find work with another team who needs a centerman who won't break the payroll. It won't be with Montreal, though. "With where the cap is going to be next year, we had to buy out Scott's contract and the safest way to do that without risking him being injured was to send him home," GM Marc Bergevin said. "It's the rules we have to play by." And that brings an end to Gomez's career as a Montreal Canadien as he was shown the door on Sunday. Gomez, of course, won the 1999-2000 Calder Trophy as the league's top freshman, and it appeared that he would have a long and prosperous career in the NHL as a slick playmaking centerman. He helped the New Jersey Devils win the Stanley Cup in both 2000 and 2003, but slumped in terms of point production as he saw declines in each season from his rookie campaign in '99-00 through to '01-02 before posting a 15-point increase to 70 points - the same total he had in his rookie year - in '03-04. After the lockout ended, Gomez put up his best total of his career in '05-06 when he finished second on the Devils in scoring with 84 points. That season also saw Gomez break the 20-goal mark for the first, and albeit the last, time in his career when he notched 33 goals! After another 60-point season in '06-07, Gomez hit the Big Apple after Glen Sather brought him to be the playmaker he thought the Rangers needed. After seasons of 70 and 58 points that were making his lofty salary hard to justify in New York, Sather packaged him with Tom Pyatt and a prospect for Doug Janik, Chris Higgins, Pavel Valentenko and Ryan McDonagh in a trade that Canadiens fans still regret. While Montreal fans were hopeful the change of scenery for Gomez would result in immediate point increases, a one-point increase in '09-10 in his first season in the bleu-blanc-et-rouge was certainly not the increase they envisioned. A 38-point season in '10-11 and 368 days between NHL goals resulted in a 11-point, 38-game 2011-12 season in which fans routinely called for his head to be placed on a chopping block after seeing nothing for the $7 million salary he was being paid. For Scott Gomez, leaving the New Jersey swamp led to some ugly times over the last six years, especially in Montreal. That being said, there's no reason why Gomez can't return next year at a modest salary with a team that can use a revitalized, rested centerman who still has the hands to play in the NHL. While it will be tough to maintain the kind of competitive desire needed for an 82-game NHL schedule, Gomez can certainly find work in Europe, the KHL, or any professional league in North America. His previous work, his talent, and perhaps a little need to show everyone they were wrong could be enough for a team to take a chance on Gomez. I know that if I needed someone with a Stanley Cup pedigree to help a few younger players on my roster, I'd approach the Canadiens to see if Gomez could be loaned to my team. After all, the worst thing they can say is "no", right? Whatever happens with Gomez in the next few months, I'd hope that he finds some passion to return to the NHL and tear it up. There's no reason he can't be one of the better playmakers in the league, but for a long, long time I have truly believed that he looked like he didn't have a care in the world whether his team won, lost, or fell through the ice. While it's nice to have that carefree attitude, it's not going to help you win many games in a league built on intense competition. I'm not here to say that Gomez wasn't a competitor. He was the first guy in Zdeno Chara's face when he stanchion-slammed Max Pacioretty. From what's been said, he's a great guy in the locker room, and he's always helping the young guys. He's a committed team player. I'm not debating any of those behaviours and/or characteristics. For everything that's been said, Scott Gomez sounds like he has been one heckuva leader and teammate for some time. What I am saying, though, is that he may have needed a boot to the rear in terms of igniting the competitive passion within him. He may have needed a shot in the arm in terms of getting him angry and fired up. Sending him home for four months before the season even starts - regardless of how Montreal does this season - should send a strong message that he simply isn't competing at an NHL level any longer. The buyout that is inevitably coming should be the insult-to-injury move that should motivate Gomez to take his game to at least another level, if not multiple levels, above where it is now. If, however, Scott Gomez simply doesn't have the passion, competition level, intensity, or any other intangible that will motivate him to return from this hiatus, this might be the last we see of Scott Gomez as a hockey player in the NHL. I'm hoping it isn't, but if it is, he should ride off into the sunset with his head held high as a major trophy winner and a two-time Stanley Cup champion in the NHL. But I'm thinking the slick playmaker will be back. And he'll be back with a vengeance and desire that we haven't seen in Scott Gomez in a long, long time. I'd be surprised if he doesn't try to land back in New Jersey. He had his best years there, and it seemed that he was more comfortable there than in any of his other NHL stops. If course, I wouldn't be surprised if a salary ceiling team like the Islanders or Avalanche come calling, either.